The fastest path to growth, safety and prosperity is to instill a comprehensive safety culture within your organization. ClickSafety has over a decade of on-the-ground experience in helping organizations worldwide achieve their safety goals. ClickSafety's extensive safety experience means we know your pain points, and in many cases, we have pre-built solutions that will help you quickly, efficiently and cost-effectively implement a safety culture at your business. Nearly half of all workers injured on the job have been employed by their company for less than 1 year, which is why it is so important to provide the proper safety training to your employees early and often. New Hire Orientations are a best practice in any industry. It is vital training that allows your organization to educate your new employees, making them personally responsible for his or her own safety as well as the safety of others. However, with new employees arriving at different locations on different dates and times, implementing this New Hire Orientation program can be a challenge. Our Standard New Hire Orientation is based around our standard courseware. You select, a la carte, which courses best meet your company’s safety requirements and we modify slightly to make it more customized. Our Custom New Hire Orientation is built entirely to your organizational needs. Our account and delivery teams will work with your internal team to develop fully-customized orientations specific to your organization. The ultimate goal of any safety training initiative is to create the safest and lowest-risk work environment, while optimizing workforce productivity. With a ClickSafety customized Online University, your organization creates a corporate association, driving greater site traffic, training enrollments and course completions. A customized Corporate Training Portal can help re-instill top management support by featuring a message on your site’s Home page from the appropriate executive (e.g., president/CEO) underscoring your corporate commitment to safety and highlighting why safety training is so important to your company’s success. 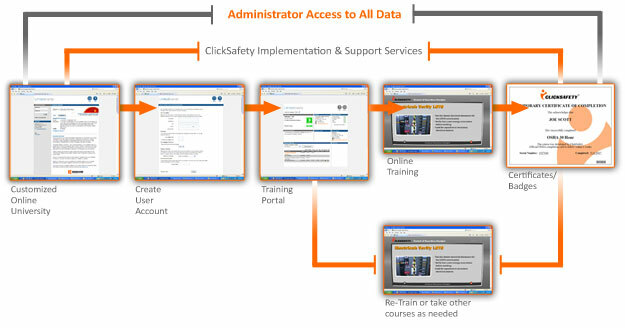 A consistent, enterprise-wide "safety voice"
ClickSafety’s Online University can significantly streamline and enhance communications by serving as a single, integrated source of safety messaging and training across the entire enterprise. When working with our customers to develop customized Corporate Training Portals, everything begins and ends with your needs - whether that means driving enrollments, showcasing top management support or creating more consistent communications. Whatever your organizations unique challenges, ClickSafety will work with you side-by-side to help you build a Corporate Training Portal that works for your organization and your employees. Just as every business is different, so is every safety program. That’s why many ClickSafety customers turn to our expert services team to customize their safety program to ensure the greatest impact on their employees and their business. Your organization wants a customized online training Login page that reflects they company’s corporate identity and safety priorities. Your organization wishes to blend some proprietary training content with ClickSafety’s online courseware and deliver them seamlessly through our LMS. Your organization requires a company-specific training certificates that can be easily printed and displayed, as well as customized training reports detailing the precise training metrics that are most meaningful for your business to track. Whatever your requirements, ClickSafety’s experienced project management team oversees every customization project to ensure it meets your company’s exact specifications and is delivered on time and within your budget. ClickSafety has delivered high quality customized solutions that are proven, cost-effective, and secure for over five years to hundreds of satisfied customers. The benefits of ClickSafety’s customized solutions are numerous. First and foremost, ClickSafety gets you the best enterprise-wide safety program with the fastest time-to-market. At the same time, we help to lower help desk and maintenance costs. And perhaps most importantly, ClickSafety frees up your internal resources to focus on your most strategic business initiatives. "I've been considering incorporating STS into our curriculum to enhance the safety skills & credentials of our supervisors [...] for upcoming Federal projects, for which this credential is specified for site safety & health officers. It aligned very well with our safety program & culture & included best in class safety approaches. " "ClickSafety tracks each employee’s progress, enabling us to measure each new employees progress and commitment to their position. For $89 per person for the OSHA 10 course, it is money well spent. I highly recommend ClickSafety online safety training. " "Gilbane chose ClickSafety to ensure that our employees and contractors are empowered with the skills they need to recognize and avoid hazards, and to more effectively implement our safety culture. "